This is an important video for educators, parents, day care workers, health care workers, librarians- anyone who cares for children before grade one. Marilyn Jager Adams, an expert on early literacy, provides research-based information on the experiences and skills needed by children for success in beginning reading. What children know about reading when they enter first grade determines how well they will read at the end of first grade. How well children read at the end of first grade is one of the strongest predictors of their success, not just in reading, but in later ability scores, whether they stay in school and their future earnings. Can they sing them, say them, write them, recognize them? Are they aware of rhymes, syllables, and phonemes? Have they had books read aloud to them regularly and interactively? 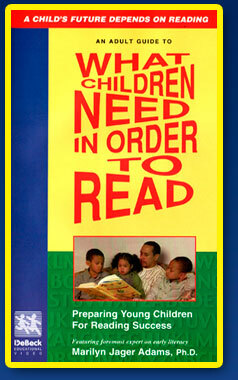 Produced by a kindergarten teacher, this accessible video interview with Dr. Marilyn Jager Adams (a scholar in educational psychology and author of Beginning to Read, Bradford Bks., 1990) shows multiethnic groups of young children enjoying books and language games with peers and adults. Adams, who enlivens her research with anecdotes and lucid explanations, holds that success in reading in the first grade is the best predictor of future success for a child and asserts that the worst thing that an adult can do is relax and assume reading will happen automatically. Explaining that the three cornerstones of beginning reading are recognition of the alphabet, understanding of the structure of the sounds it symbolizes, and the pleasure in book sharing, she urges teachers and parents to take but task-oriented approach to exposing small children to words and books. Parents are encouraged to read to babies soon after birth; games, read-aloud sessions, and storytelling are also vitally important. Soft classical piano music accompanies footage of happy tots discovering words together with smiling adults. A few older elementary-school children are depicted as reading learners as well. The tape will enlighten children's librarians as well as teachers and can serve as the basis for a library program for parents of preschool and kindergarten children. - Joyce W. Smothers, Monmouth Cty. Lib., Manalapan, N.J.